Pan American Airways’ Martin M-130, China Clipper, at Macau, 1937. AIR LINK AROUND WORLD FORGED. 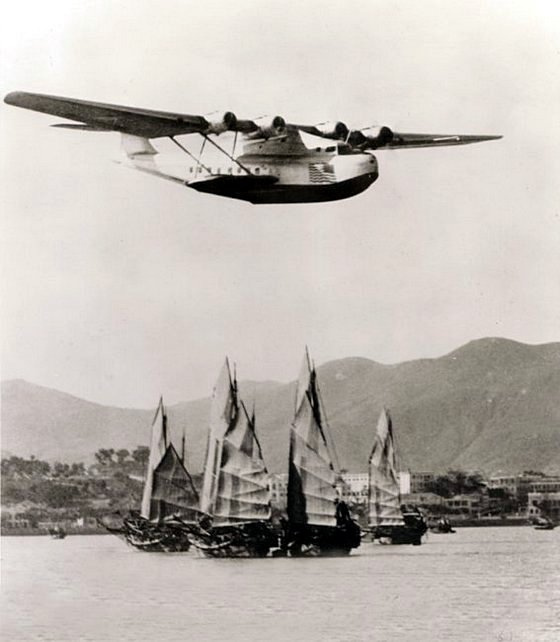 China Clipper Lands At Hong Kong. 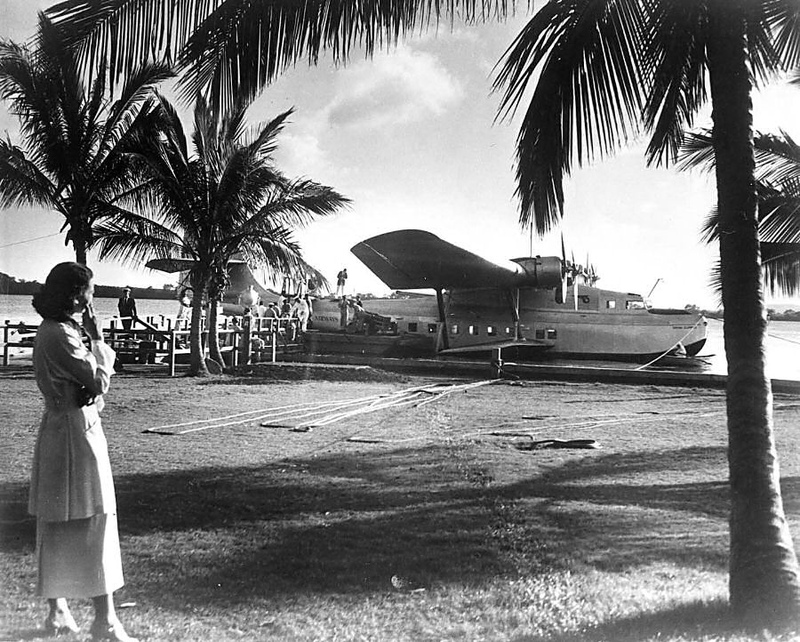 The Pan-American Airways flying boat China Clipper landed at 11:55 this morning from Manila and Macao. This links the Pan-American and Imperial Airways, completing the commercial air link round the world. —Reuter. —The Straits Times, 28 April 1937, Page 1, Column 4. 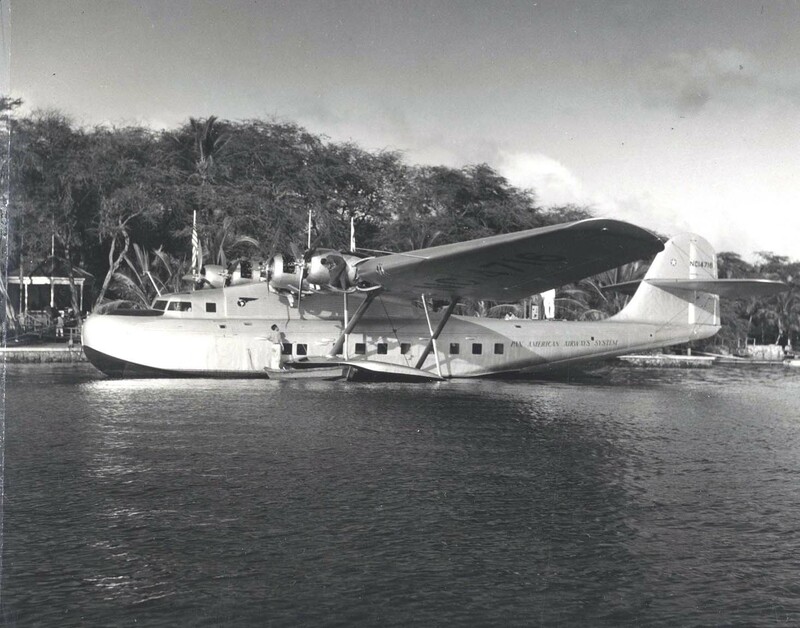 The China Clipper, NC14716, was the first of three Martin M-130 four-engine flying boats built for Pan American Airways and was used to inaugurate the first commercial transpacific air service from San Francisco to Manila in November, 1935. 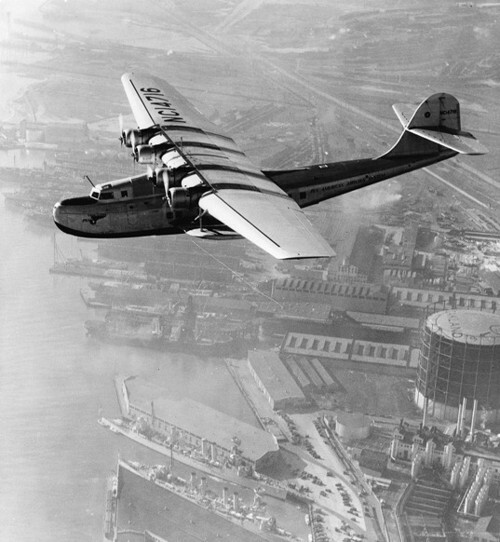 Built at a cost of $417,000 by the Glenn L. Martin Company in Baltimore, Maryland, it was delivered to Pan Am on October 9, 1935. The airplane was operated by a flight crew of 6 to 9, depending on the length of the flight, plus cabin staff, and could carry 18 passengers on overnight flights or a maximum 36 passengers. The Martin M-130 was 90 feet, 10.5 inches (27.699 meters) long with a wingspan of 130 feet, 0 inches (39.624 meters). It was 24 feet, 7 inches (7.493 meters) high. Its maximum takeoff weight was 52,252 pounds (23,701 kilograms). The flying boat was powered by four air-cooled, supercharged, 1,829.389-cubic-inch displacement (29.978 liters) Pratt & Whitney Twin Wasp S2A5-G engines. These were two-row, 14-cylinder radial engines with a compression ratio of 6.7:1. The S2A5-G was rated at 830 horsepower at 2,400 r.p.m., and 950 horsepower at 2,550 r.p.m. for takeoff, burning 87-octane gasoline. They drove three-bladed Hamilton Standard Hydromatic constant-speed propellers through a 3:2 gear reduction. The engine was 3 feet, 11.88 inches (1.216 meters) in diameter and 4 feet, 8.75 inches (1.441 meters) long. It weighed 1,235 pounds (560 kilograms). The airplane had a maximum speed of 180 miles per hour (290 kilometers per hour), and a cruise speed of 130 miles per hour (209 kilometers per hour). The service ceiling was 10,000 feet (3,048 meters) and its range was 3,200 miles (5,150 kilometers).